San Fernando is the second largest city of Trinidad and Tobago. About 50,000 people live here. It used to be a borough, but was made into a city in 1988. Pitch Lake is located here. ↑ "List of Postal Districts". TTPOST. TTPOST. July 29, 2018. Retrieved July 29, 2018. 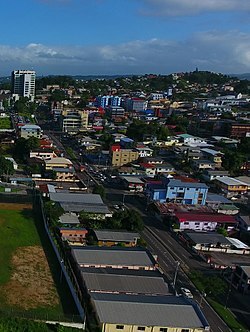 Wikimedia Commons has media related to San Fernando, Trinidad and Tobago. This page was last changed on 20 August 2018, at 00:35.